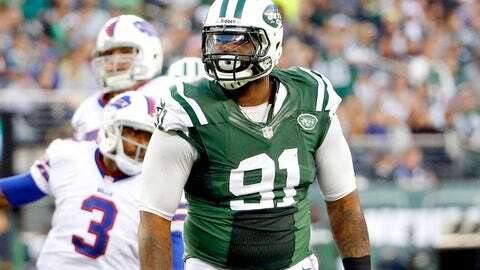 New York Jets rookie defensive tackle Sheldon Richardson believes head be the No. 1 overall pick if the NFL were to redo the 2013 draft. After a dazzling season that has made him a strong contender for the Defensive Rookie of the Year Award, Richardson was boastful. "Probably No. 1, most likely," Richardson said per ESPN New York. "Kansas City? Yeah. I went into the draft thinking I’d be the No. 1 pick. I had a shot." The Missouri star was taken 13th overall by the Jets, four slots behind cornerback Dee Milliner, who went to New York in the No. 9 slot. The 6-foot-3, 294-pound Richardson has racked up 66 tackles (12 for loss), forced 3.5 sacks and led the renaissance of Rex Ryanâs defense. Ryan believes Richardson has earned recognition. "I just look at the film. Base it on production. Production’s a huge part of it," Ryan said. "But the way he plays, he’s got that relentless motor, and for a defensive tackle being as productive as he is — it doesn’t necessarily show on the sack total, but he’s got  hits on the quarterback — and [there’s also] the way he’s played the screen game. His tackles are probably among the league leaders for defensive linemen. The Rookie of the Year Award will likely come down to Richardson, Carolina Panthers lineman Star Lotulelei or Buffalo Bills linebacker Kiko Alonso.